Toni Cipriani on an Avenger. The Avenger is a motorcycle in Grand Theft Auto: Liberty City Stories. The Avenger is a rare chopper-style motorbike, based off of a classic Harley-Davidson, like the Freeway and Angel. 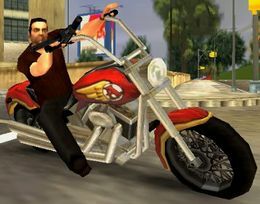 The top speed, acceleration and handling are considerably better than the other chopper bikes of the GTA III Era; the Angel and the Freeway. It is bulletproof and fireproof, however, it can be damaged through collisions, close proximity to vehicle explosions, or firing a Rocket Launcher at it. The Avenger can be only obtained once, which is completing 15 Avenging Angels side-missions in Portland, where it will spawn at the Portland Safehouse in Saint Mark's. However it will not permanently spawn, so save it at a garage to avoid losing the bike. The color scheme may be related to those of Iron Man (red and gold) for he is one of the Avengers in the Marvel universe. This page was last modified on 6 August 2012, at 22:40.